inc: vt1300cs Sabre, vt1300cr Stateline ABS and vt1300ct Interstate for Shift Kits. Frustrated with trying to find an "almost 90 degree" screwdriver with a "D" socket to fine adjust your fuel screws for best idle and cruise? 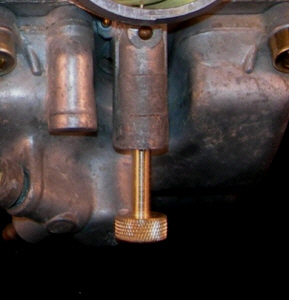 Use Factory Pro's new "finger adjustable" fuel screw to adjust idle and cruise fuel mixture for best throttle response. Traveling to high altitude? It's easy to lean out the lowend temporarily. Use a small bent wire to pull it out if it doesn't drop out. Keep the old parts for "spares". Dream come true! SMOOTHER shifting. New FP Shift STAR and FP Detent Arm. Uses the stock detent spring. Clutch cover gasket not required, as Honda seals the clutch cover with 3 ThreeBond 1104 or HondaBond or YamaBond or SuzukiBond or KawaBonda or similar non-hardening sealant. Big, strong cruisers have big transmission gears and they generally shift "lazily" and clunkily, unless you use "exactly the "right" rpm and throttle. If you ever make a quick shift and feel and hear the gears grind / ratchet before maybe engaging - that is what causes shift fork and gear damage - especially in 2nd gear. A new FP MicroBearing detent arm and the final piece... A completely redesigned, empirically refined, multi angled, variable radii, repeaked and valleyed FP Shift STAR. In town? Low rpm cruise in second - shift to third? Quicker and smoother - NO more clunky, lazy shifting in town - it's different and improved. Proven concept - Virtually all the Factory Pro Support riders in the AMA and WERA multi- Champions Vesrah Racing tested and proved the EVO-7 Stars. Kit includes a new detent arm with a low friction microbearing roller and the NEW Factory Pro EVO Detent Star. It's a "relatively inexpensive" kit that will smooth out shifting over stock and help prevent shift fork damaging missed shifts. We do not yet have detailed instructions - and need a bike to take pics of and write up an Install Page. If you are local to San Francisco and can spare a day, we will install the kit for 25% discount on labor. Threebond, Hondabond, Kawabond, Yamabond non-hardening gasket sealer. 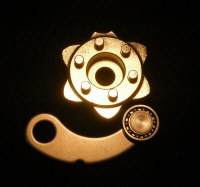 EVO Shift Star and Microbearing Detent Arm only requires the removal of the clutch cover. The Star and Arm are easily accessible. 60 minutes work + cleaning the gasket surfaces. I recently purchased your jet kit & Longboy screw for my 07 vtx 1300, after trying to get my setup right with the Barrons BAK jet kit for 6 weeks, with no luck. I put Factory Pro jets and needle in, and Jackpot. my first setup seemed to hit the nail right on the head. I will never fight with another companies jet kit again. From now on its only Factory Pro. Thanks for a great product Factory Pro. The internet's #1 Stage 3 choice. 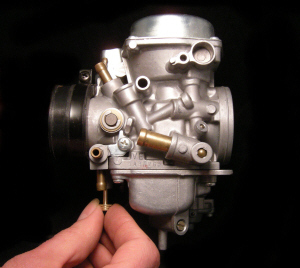 carb kit for the 03-09 VTX1300s / c / r t.
Maxair already supplies a special version of this kit bundled with their products. This is the kit that generally adds more low-end / midrange than stock or dynojet, if the proper main jet is selected, more top-end power. Easy to install and tune - no slide drilling. Some VTX 1300's came with what we call a "2.9bt" clip area configuration and some didn't. The difference is that the clip area of the needle might be 2.9mm and the hole in the slide that the needle goes into may only be 2.8mm. The immediate solution. if you have that mismatch, is to use a small drill bit to enlarge the slide hole. Proper tuning involves trying a couple different main jets, till you find the set that pulls the hardest at "high" rpm and upper midrange. It's rarely under 210 with our needle. Then, raise or lower the needle till you get the best full throttle midrange. If you've done that, then, 99% of the time, you'll have very good cruise and throttle response. Adjust the idle speed for lowest possible idle. Then, adj the fuel screw for the best/highest idle. Then readjust the idle for lowest possible idle, again. Then readjust the fuel screw for best/highest possible idle. Now, you have the fuel screw exactly where it wants to be for most efficient idle. Then, finally, raise the idle speed adjuster back up to where you want it to idle. If necessary, trim the fuel screw for cleanest cruise. 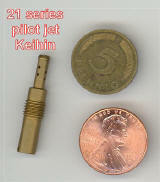 If the fuel screw ends up at 1 turn or less, the pilot jet is probably too large. If you are more than 3.5x out, then the pilot is probably a size too small. When you take the white, plastic "needle retainer" out of the top of the slide, turn it over and you'll see a small spring, about the same size as a retractable ball point pen spring, wound onto a plastic post. You will need to cut the "post" down to 1/2 height to give enough room for the longer Factory pro needle. If you lose your stock "needle retainer" spring, sometimes you can use a ball point pen spring as a replacement. Sweet! Scooter running SO much nicer! Took bike to shop this morning for 27,000 mile service, MaxAir box installation, and rejet with your kit I bought (VTX1300). Absolutely night and day difference. I just wanted to drop you all a note and say this jet kit is awesome. After losing almost a whole riding season because I couldn't get the Dynojet kit to work right I wish I would have found your website earlier!! No matter how hard I tried I could not get the pilot jet set right and always had 1/4 throttle problems. You all really need to be sure your products get the visibility they deserve because the difference is indeed day and night. The internet's #1 choice of carb kits for the VTX. Adds more low-end / midrange, if the proper main jet is selected, more top-end power. Easy to install and tune - no slide drilling. Even though it's a "1.0" kit, it works well with aftermarket air cleaner / air filter kits. The difference is that the clip area of the needle might be 2.9mm and the hole in the slide that the needle goes into may only be 2.8mm! The immediate solution. if you have that mismatch, is to use a small drill bit to enlarge the needle's slide hole. The low speed mixture: Adjust the fuel screw for best and lowest possible idle. Then, when the Fuel Screw is optimized, then lower the idle speed again to where you actually want it). The tricky part: If you end up at 1 turn, or less, the pilot jet is probably too large. If you are more than 3.5x out, then the pilot is probably a size too small. When you take the "needle retainer" out of the top of the slide, turn it over and you'll see a small spring on a plastic "spring holder". We are interested in properly tuning bikes- not "what's the least I can get away with". We had a terrible time trying to tune my 2009 VTX1300 using a set of Dynojet components after adding slip on Cobra pipes (slash cuts), and a K&N filter element. After a little Internet research, we ordered and swapped out the Dynojet kit initially installed and swapped in your stage-1 Factory Pro Jet Kit. Our first try - as your instructions recommended: set the needle with clip fourth from the top, installed the 215 main jet & 58 pilot jet, used the stock springs, clipped the plastic spring/needle holder as described (1/2 clipped off), set the fuel/air to 1.5 turns, and PERFECTION! There was no rich or lean backfiring, no dead spots at any throttle/gear settings, and there is an unmistakable power boost - especially on the high side. The bike is now very happy with easy start ups on cold mornings and smooth, powerful operation (near sea level) through the days. Gasoline mileage has not changed at all, which surprises me, given I now tend to really throttle it up to speed. Well done Factory Pro!! The only way to accurately measure float heights. Works on nearly every carburetor. Lean backfire (worse when cold): Richen (unscrew) fuel screws 1/2 turn at a time. Rich backfire (worse when hot): Lean (screw in) fuel screws 1/2 turn at a time. Final screw setting should usually be between 1.5 and 4 turns out. If more than 4x, increase pilot jet 1 size to #58 from the stock #55. Note:: Factory Pro R/D was done @ 70 to 80 degree temp, sea level, 92 octane Beacon Premium, stock ignition timing. Book a sightseeing flight over the Wine Country or a Kamikaze aerobatic flight or a biplane flight over Infineon Raceway, the Golden Gate Bridge and the San Francisco Bay for one or two during the month of August and September and get a free souvenir t shirt! Just say that you saw this on the Factory Pro website! Marin French Cheese Co., also known as The Cheese Factory and Rouge et Noir is not just the oldest cheese manufacturer in the country, but a vacationers and day trippers destination as well as a unique part of American History. Located north of San Francisco, east of Napa County, west of Pt. Reyes and Olema and south of Sonoma County, Marin French has produced hand crafted Artisan soft ripened cheese since 1865. Rouge et Noir cheeses are similar to French and European varieties but reflect the characteristics of Northern California, producing it's own regional style.